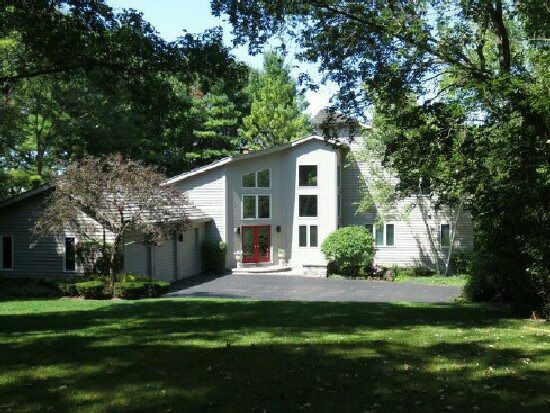 Opportunity to own this fabulous one-of-a-kind 4-bedroom, 3 1/2 bath custom home in sought-after South Long Grove. Open, light-filled and exquisitely livable, this stunning contemporary features over 5,000 square feet of luxury living on over 5 acres, walls of 2 story windows and 5 skylights to usher the outside in. 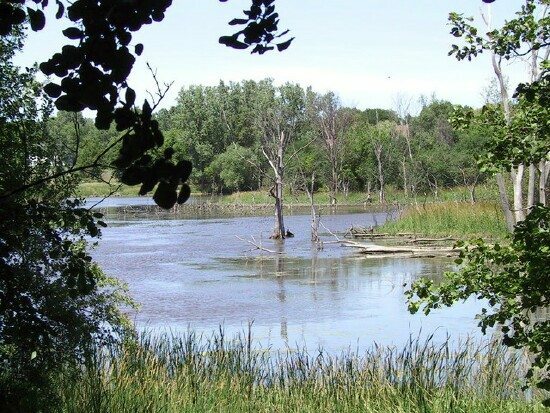 Surrounded by trees and your own protected nature conservancy, yet minutes from shopping and transportation, this home offers a lifestyle to be envied. 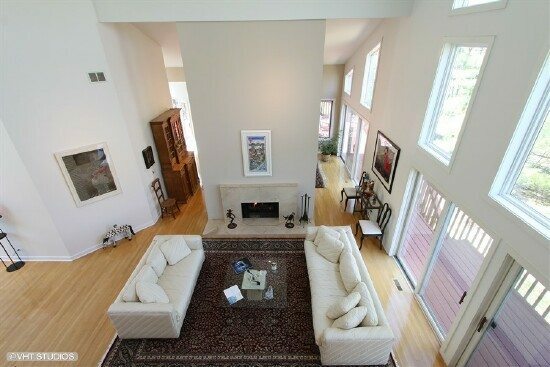 Open floor plan, vaulted ceilings, hardwood floors, 2 fireplaces, and striking architecture make this house a stand out. 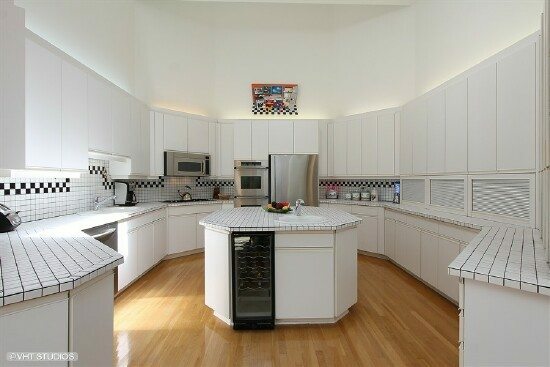 The octagon-shaped kitchen with high end stainless steel appliances, huge island with second sink, vaulted ceiling and skylights is both functional and unique. Overlooking the living room and conservancy, a light drenched loft leads to a private master suite with large walk-in closet, balcony, and travertine master bath with spa tub, seamless shower and skylights. This very special home boasts a huge wrap-around deck, a private brick patio and endless views for outstanding indoor and outdoor living. All new mechanicals, meticulously maintained and extensive updates. Stevenson High School. Priced well below market to sell quickly. Sensational 2-story foyer with natural oak hardwood flooring, vaulted ceiling, walls of windows, guest closet, dramatic lighting on dimmers. Awe-inspiring 2-story living room with vaulted ceiling and wall of windows offering breathtaking views of conservancy, two sets of sliding doors to wrap-around deck, natural oak hardwood floors, stunning 2-sided travertine wood-burning gas fireplace and recessed lighting on dimmers. Great view down into the living room from the loft above featuring 2-sided travertine wood-burning fireplace. Vaulted ceilings, walls of windows bring the outside in, French Doors to private deck overlooking woods, sliding doors to south deck. 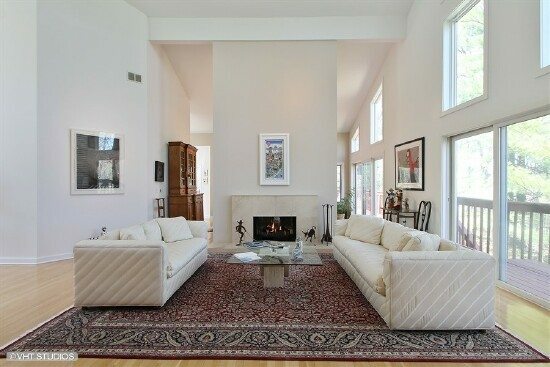 2-sided travertine wood burning gas fireplace, dimmer lights, and natural oak hardwood floors. 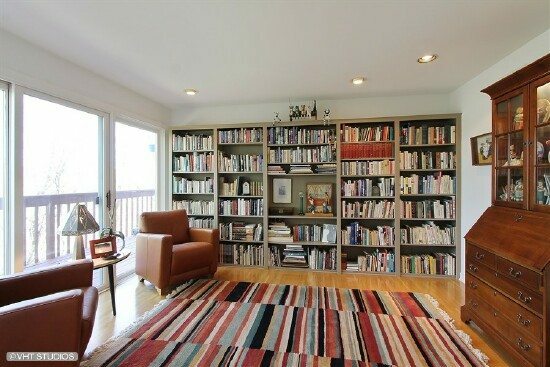 Off of the living room, a fabulous library boasts a built-in wall of bookcases, recessed lights on dimmers, 2 sets of sliding doors leading to a wrap-around deck and gorgeous views. 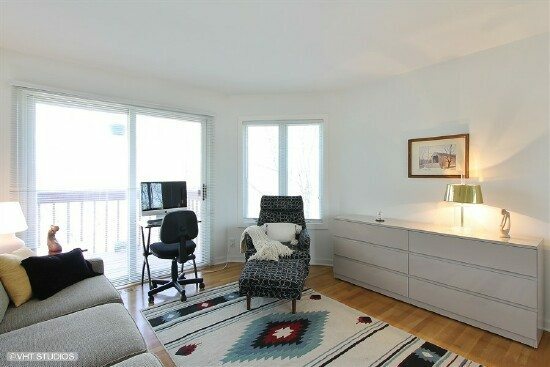 Can be closed off to living area with solid wood sliding pocket doors. Natural oak hardwood floors. Unique and highly functional, this 2-story octagon shaped kitchen offers many amenities including an island with second sink, “Kamwood” cabinets, dramatic up and under-counter lights, newer top of the line appliances and fixtures, 2 skylights, vaulted ceilings, all complemented by natural oak hardwood floors. Storage galore is an understatement with the huge pantry. 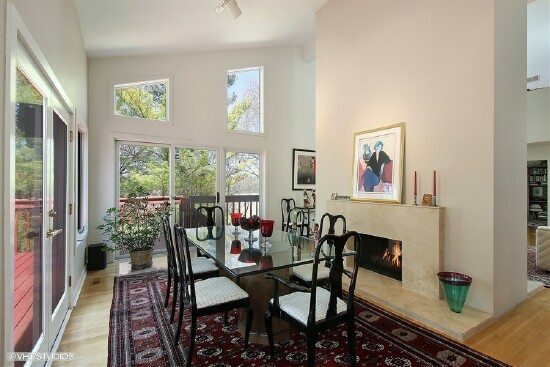 Perfect informal dining area. 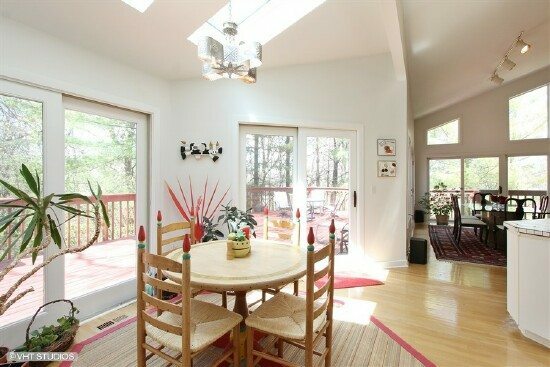 Bright and open with 2 skylights, 2 sets of sliding doors to the deck, vaulted ceilings complemented by the natural, oak hardwood floors. 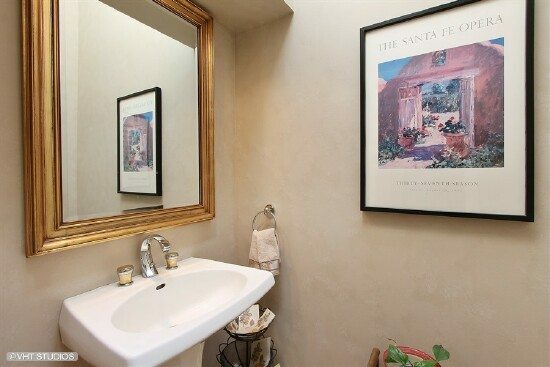 Located just off of the kitchen, this 2-story powder room wows you with its’ vaulted ceiling, skylight, recessed lighting, pedestal sink, custom mirror, custom paint, and natural oak hardwood floors. Large window with beautiful southern view, mini-blinds, 2 huge closets, including a walk-in. Newer oak hardwood floors. 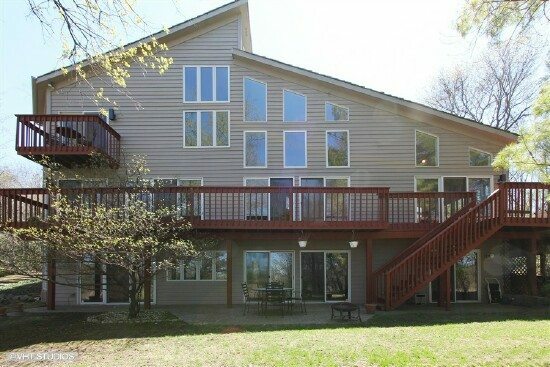 Sliding doors to wrap around deck, wonderful views and light, large closet, mini-blinds, newer oak hardwood floors. 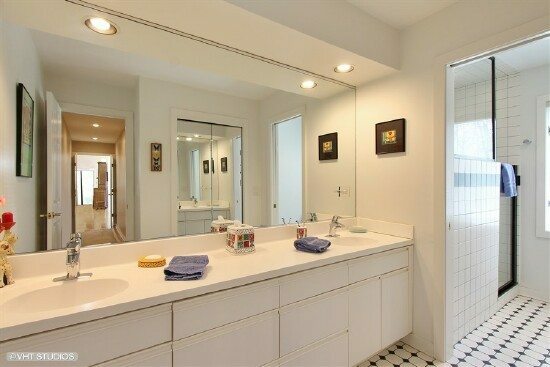 Double vanities, Corian counters, “Kamwood” cabinets, ceramic tile floors and shower, Hans Grohe fixtures, uniquely tiled walk-in shower, pocket door provides privacy for commode or shower, large linen closet. A true sanctuary. Loft off master features windows to conservancy, and spectacular views galore as well as a vaulted ceiling and ceiling fan. 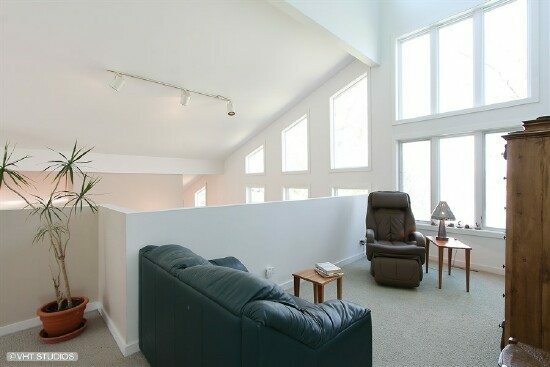 The loft also overlooks living area and is a great place to curl up and read a book. 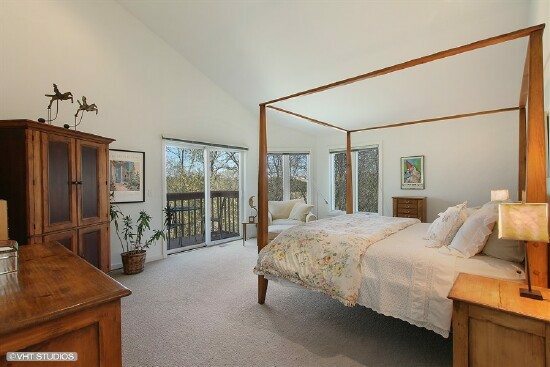 French doors from loft to master suite offer privacy. Retreat to the large master bedroom where you will find lots of windows and light, vaulted ceiling, recessed lights on dimmers, new sliding door to private balcony overlooking backyard and conservancy. Plush Berber carpet, mini blinds. Wired for home theater surround sound. Large walk-in custom closet with 2-sided dresser. Crawl space above offers additional storage space. 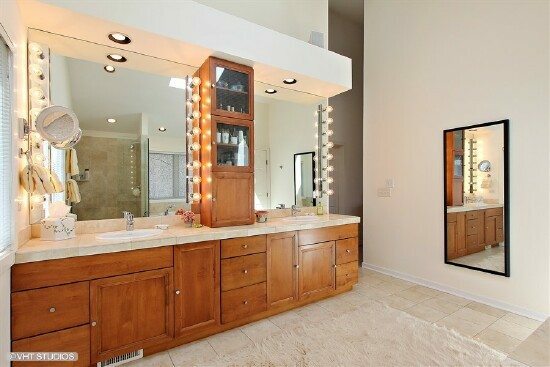 Completely remodeled with travertine tile, new custom cabinets, double vanity, high efficiency commode, Hollywood make-up lights, lighted make-up mirror. 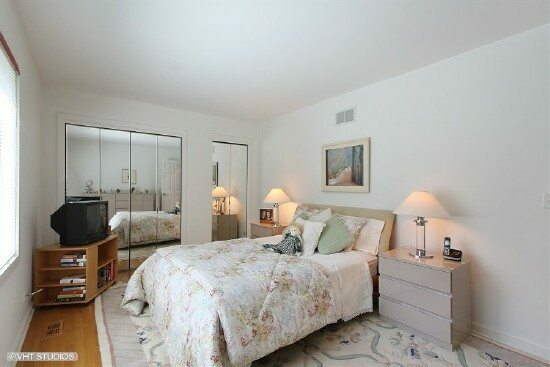 Adjacent to a dream walk-in custom closet with 2-sided dresser. Your own mini spa! 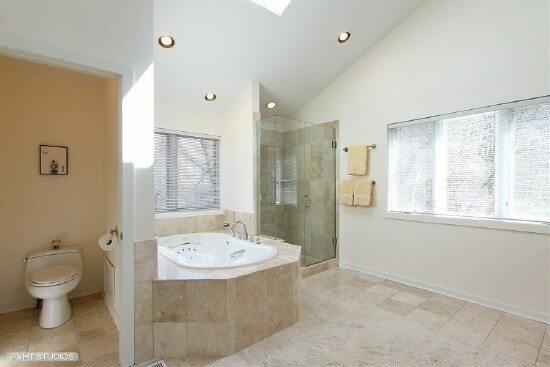 High end oversized Kohler jetted tub, Grohe faucets, Kohler fixtures, seamless glass shower door surround, recessed lights on dimmers, skylight plus two walls of windows and wired for stereo. 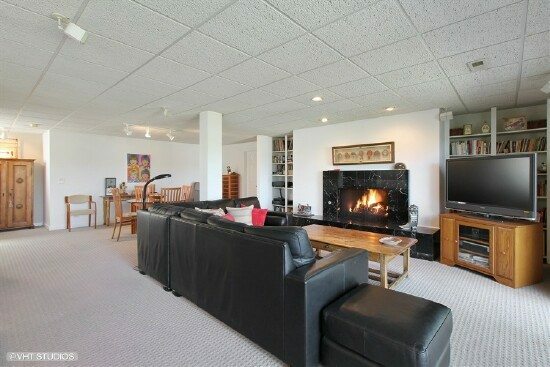 Superb, large family room with walls of windows and multiple sliding doors to backyard paver-brick patio. Built-in recessed shelves on either side of massive raised-hearth marble wood-burning fireplace with gas starter and logs. Located on the walk out lower level, this amazing space offers a wall of windows spanning the entirety of the room with sliding doors to the backyard paver-brick patio, built in spa and wet bar with recessed lighting on dimmers and Berber carpet. 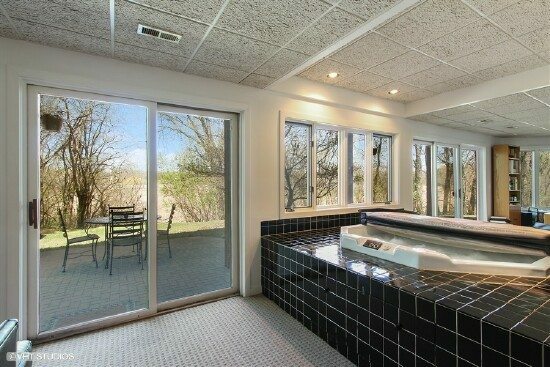 Relax in the built in spa, and enjoy the wet bar with breathtaking views of the backyard. Another great large, bright and open space with sliding doors that lead to paver brick patio. New Berber carpet. Enormous wrap-around deck offer unbelievable views of the vast property and endless entertaining and relaxing opportunities. Huge, wrap-around deck with views from every vantage point, gates and steps to the lower level patio, a new wood fence dog run on the side of the home, new stone walkway from the from house to backyard and paver brick patio spanning the backyard. Washer, dryer, sink, built-in cabinets, natural oak hardwood floors, large coat closet, crawl space above. 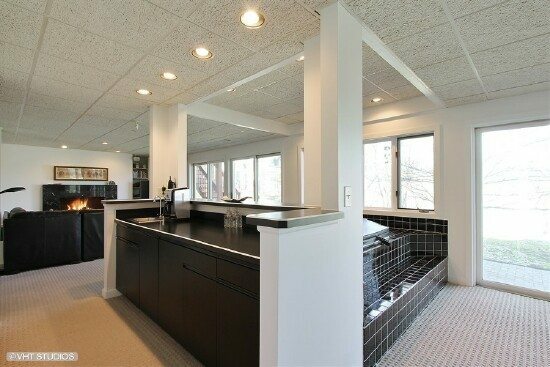 Oversized three-car garage boasts built-in storage, workbench, and door to dog run. Three separate paneled garage doors with openers, plus keyless entry pad make getting in and out super easy. 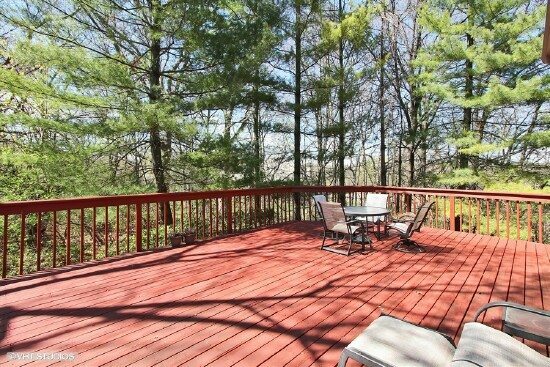 Great large area features a new fence (2011) and is accessed from the garage and also opens to the wraparound deck. Gate to yard.